What did you think of DAREDEVIL #1? Please use this thread to discuss the issue. It has 138 pages... full comic, variant cover gallery, full script, line art and coloured pages (with no text), and character designs for $4.99. Very great start so far! I already like Cole North! Damn it. I don't get the comic digitally, but I really want that now! I liked this issue a ton. For a first issue, it seems to be trying to make a statement. In particular, it focused a lot on exploring Matt's past through three separate scenes. First, him as a kid breaking his father's commands not to fight back. The use of religion and following man's law and when it's OK to break the law to help someone are all explored. I'm not saying this is Daredevil #191, but it's still a great statement. Then we get Matt after he was blind. This one is much more on the faith aspect of it. Finally, we get to explore Matt as vigilante and whether he's doing this to help people or more of an addiction. Common themes for the character, but handled well. I hope we can see more of it going forward. Speaking of that last part, we explore it quite a bit with a new character - Detective Cole North. He's definitely set up as someone with a different view than Matt. I do think a cop that doesn't like superheroes is well-worn. I'd love it if they freshened it up - how about a defense attorney who has a problem with them or a community organizer? Still, since we're in the reign of Mayor Fisk, it makes a ton of sense. Obligatory legal quibble: Daredevil says there was a robbery in progress. For this, I refer to Ant-Man that technically it's not a robbery. Robbery involves threat (or force). Instead, it's a Burglary. It's also referred to as a Breaking and Entering. That's correct and is a wonderful tie-in the flashbacks. Although, I'll also add that any opening or moving of something to get in (such as opening a door or lifting a window) is a breaking regardless of whether anything was broken. The art was beautiful. Checchetto's art is top notch, although I will point out the notches in his mask are back. There's an interesting set of panels alternating between North and Wilson Fisk that worked quite well, especially for the reveal of what happened in the fight. That's definitely going to have implications going forward. The backup story is actually a work of genius. It took me a second to realize what was going on and how the two sides paralleled each other, but I can't help but me impressed with all the little things they did. One of the cool things (I have no idea how it shows up on digital) are the nearly black panels. In these panels, there's actually black silhouettes that you can see if you catch the light just right that are impossible to see otherwise. This was a great issue. I’m new to Daredevil and comics but I really enjoyed the story and art. I have a feeling the next few issues are going to be full of a lot of Catholic guilt. I got the comiXology issue. Loved the directors cut extras. It was a good first issue. With exception to the action sequences, I'm not completely sold on the art. The cliffhanger had me backtracking and reexamining certain panels. I'm curious to see where this goes from here. And how about that short backup? I thought it was fantastic. Overall, I felt this was an amazing first issue. I absolutely love the art and hope this stays for a good long while, it might not ever top Maleev for me; however, I could see myself enjoying it quite a bit. I think the young Robert Redford inspired look for Matt is a great one. I like the current state in which Matt is in and, while the themes presented are very much familiar I feel like we are going to see a new unique spin on them. I also felt like there was a bit of influence from the Netflix series and I mean that in a good way. I also thought the line about Foggy buying a moving truck every time he meets a women was one of the funniest things I had read in Daredevil comic in quite some time. The cliffhanger presents an interesting opportunity to explore and overall I am quite excited. The only thing that didn't quite make sense to me was that while I liked the whole interaction with the woman at the bar and we got to see a bit of the charming, suave Matt I did find it a little hard to believe she didn't know who he was or would have eventually figured it out. We are not that far removed from him being mayor so I imagine he would be recognizable and he was quite recognizable even before that within Hell's Kitchen. I certainly understand why they did it that way to play up the mysterious part, just something I thought I would call out. I’m slightly on the fence here. I have a little problem with the prose so a couple of time i had to reread what the characters were saying just to be sure i undersood what they meant. I’ve always liked the idea of matt having a priest he can confide inas a supporting character and thought in the last volume it was going to happen with father jordan but then he turned into a space knight and that went out the window. Maybe this priest will come back and establish himself in the books as a way for matt to keep an eye on his own morality when foggy isnt able to fill that role. I like the idea of the cop. I’m hoping he turns out to be something like tritter from house season 3. His motives are personal rather than professional and he singles out house. Tritter ignores the good house can do and the lives that will be lost if house goes to jail. He cares less about the greater good and is solely focussed on his personal vendetta and house keeps doing just enough bad stuff for tritter to feel justified and continue to tell himself he’s the hero. I’d love a story like that for daredevil and to be fair, if he did kill that man that could be how this plays out. I’m not fully convinced he did though. It’s just too huge for the character which makes me think they may walk it back and say that fisk or even the cop killed him to frame dd. We’ll see. I think this has the potential to be a great run but i’d want to read a couple more before committing to an opinion. 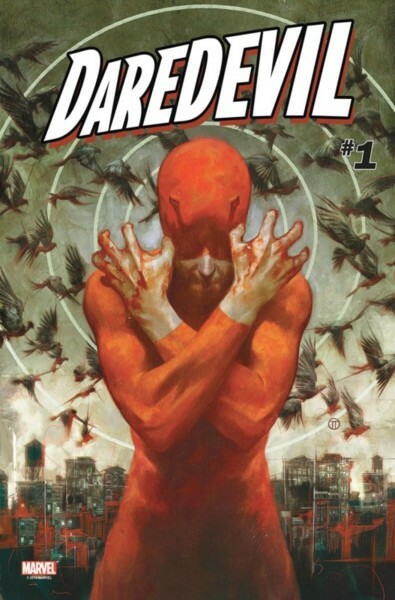 I don't think I've been this excited about the Daredevil comic since Volume 3. I did not expect this from Chip Zdarsky. I've only read an issue of Howard the Duck and the first trade of his Spectacular Spider-Man. Zdarsky just flat-out gets Matt and gets Daredevil. At times the comic treads very close to where the Netflix show has gone, in particular the flashback scenes with the Church, but for the most part we're picking up where the weekly Man With Fear series left off. Matt still isn't operating at 100 percent, and that is made painfully clear. Zdarsky has clearly invested some thought into Matt's character. I love that young Matt was focused on justice at an early age, and how much getting blinded during an act of good shook his faith. I am very much looking forward to Zdarsky's further insights into who Matt is. Otherwise, this issue has it all. I enjoyed the banter back and forth between Matt and the woman from the bar. Detective Cole North promises to be an exciting new character. What more can be said about Marco Checchetto's art. I, too, hope he stays with the title for a long time, but I don't know how quickly he can turn out an issue. Maybe he'll do an arc, and then another artist will do the next one, and he'll return. Kind of like Ron Garney during the last volume. This is an amazing start to a new volume. I gave it a perfect score.